vickichristine: photo booth mondays. it begins here. mondays can be rough. real rough. and as such, i've devised a plan to get yours and mine off to a fun start! 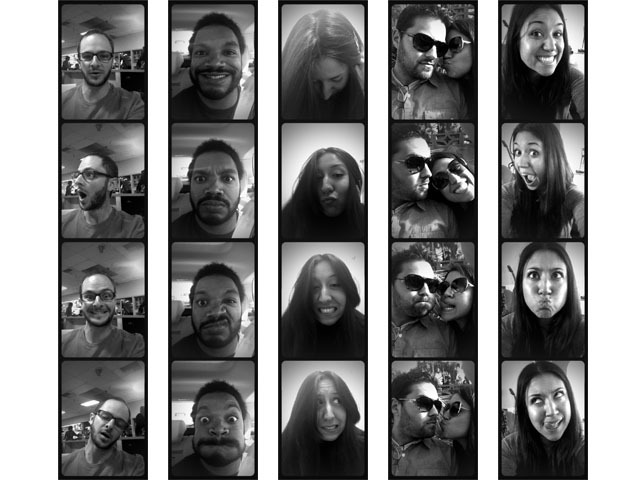 by collecting as many photo booth strips as i can throughout the previous week(s) and exploiting featuring them here each monday, the day may feel brighter. brighter because we had so much fun last week, brighter because of all the fun to be had this week. and truly, who doesn't love a photo booth? i think some explanations are in order. 1. bowling league bowler, at the alley, practicing with his new ball. no, that's not nerdy. 2. during a long car ride to los angeles proper. antsy is an understatement. 4. me and hank, sitting under a tree, k-i-s-s-i-n-g.
5. just your average gal, making faces at her phone from the couch.